There are a lot of reasons why “San Junipero” is a lot of people’s favorite Black Mirror episode. First and foremost, it has a happy, triumphant ending, as opposed to oppressively bleak conclusions of its predecessors. Second, it’s a love story, and who doesn’t like those? Third, despite the fact that those first two points make it an anomaly in the Black Mirror catalog, it still features one of show’s signature slow-burn, sci-fi plot twists. In a recent oral history of the episode, show creator Charlie Brooker explains how difficult it was to appropriately tease out the reveal that the two young lovers dancing their way through an 1980s pastiche were actually 70-year-old women taking part in a simulation. “Writing a script like that is like being forced to come up with dialogue that rhymes,” Brooker tells Vulture. 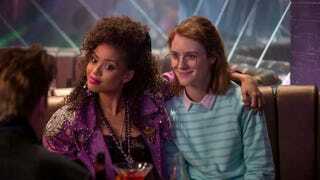 “It’s got to do two different things at once.” What Brooker means is that everything Kelly (Gugu Mbatha-Raw) and Yorkie (Mackenzie Davis) say to each other has to make sense both in the context of two young people in 1987 and two aging women who are aware they’re plugged into a simulation. What’s more, for the first half of the episode the audience isn’t aware the 1980s setting is a facade, so Brooker had to be careful not to give too much away too early. More subtle clues include the song “Girlfriend In A Coma” by The Smiths playing over a shot of Yorkie, who, it’s later revealed, is literally in a coma outside the simulation. Brooker also included a few visual jokes in Tucker’s arcade when Yorkie travels to a simulation of 1996 to look for Kelly. The games Time Crisis and House Of The Dead can be seen in the background, both of which are tongue-in-cheek references to the episode’s setting.